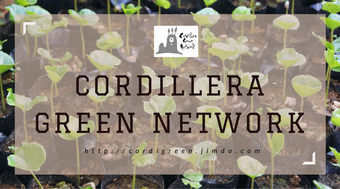 The Cordillera Green Network, Inc. (CGN) is an environmental NGO based in Baguio City. It has conducted agroforestry coffee projects in many rural communities as a part of its effort to help improve the livelihood of indigenous people as well as to protect environment in the Cordillera. Agroforestry is a cultivation system in which agriculture and forestry are combined. In agroforestry, various trees or shrubs are simultaneously grown among or along various crops. In 2003, CGN conducted its first coffee agroforestry project and distributed coffee seedlings to farmers in Poblacion, Kibungan, Benguet. Since then, it has been promoting coffee cultivation, using agroforestry method in many communities, such as Palina and Sagpat (Kibungan, Benguet), Kabayan, Tublay, Hapao and Balamban (Ifugao), and Kadaklan (Barlig, Mt. Province). In the planting sites, fast-growing alnus and calliandra, a leguminous tree that enriches soil, are planted among native Benguet pines. Then, coffee seedlings are transplanted among these trees. When coffee trees grow tall and create shade, turmeric, taro, and ube are planted under the coffee to create diverse and ecological environment and ensure multiple source of income. The main cause of deforestation is forest fire caused when farmers set fire on forest to convert it to vegetable fields. Because of poverty, indigenous people are forced to set fire on forest to sustain their lives. In agroforestry, they can have income while preserving forest. It is advantageous both for environmental conservation and improving livelihood. Coffee has three main varieties, namely Arabica, Robusta, and Liberica. In the Cordillera, Arabica and Robusta are mostly grown. In general, Arabica grows in areas higher than 700 meter altitude. It has good taste and aroma. However, it is sensitive to environmental changes, pests and frost attack. On the other hand, Robusta is stronger and can be grown in lowland under hot and humid climate. Robusta coffee has characteristic smell and bitter taste, and contains more caffeine than Arabica. In CGN’s agroforestry projects, seedlings of Arabica coffee are transplanted. A large part of the Cordillera is a mountainous region higher than 700 m altitude. It has distinct two seasons, the rainy season and the dry season. These climatic and geographic characteristics of the region meet the conditions for growing quality Arabica coffee. Arabica coffee has many varietals. In the Cordillera, mainly Typica, Bourbon, San Ramon, Mundo Novo, and Granica are cultivated. CGN promotes agroforestry coffee cultivation for the following reasons. 1. Coffee has been a traditional drink for indigenous people, and many of them already have experience in cultivation. There is a local market for selling green beans. Therefore, surplus or low quality coffee, which does not meet export quality, can be sold there. 2. Unlike rice, coffee is not a staple food, but a beverage. Therefore, even if farmers sell their coffee, it does not deprive them of food. 3. After drying, coffee green beans can be preserved. The farmers can choose to keep them when the price is low, and sell them when the price goes higher. Unlike vegetables, coffee is not perishable. Even if a road to the market is closed for landslide or typhoon, it does not cause financial loss. 4. Coffee seeds can be taken from the coffee trees in the communities, and used for growing seedlings. Anybody can expand their cultivation without investing much capital. 5. Because coffee can be grown only in the equatorial region, it can be exported to developed countries like Japan, North America and Europe, and provide a stable source of foreign currency. Recently, the demand of coffee is increasing in South Korea and China as well. 6. The Philippines exports Arabica coffee. The domestic demand is also high. Coffee trees bear their first fruits 3-4 years after transplanting seedlings. Some of the seedlings which were planted under CGN’s initiative are already mature and ready for harvesting. One of the big challenges for the farmers is processing of coffee cherries. In order to export green beans, they need knowledge and equipment for post-harvest processing. Personnel with expertise in quality management is also needed. In addition to offering advice on cultivation, CGN provides assistance in improving post-harvest processing. Furthermore, CGN believes that cultivation and sales of coffee should contribute to improving livelihood of coffee farmers. CGN promotes fair trade and support the farmers in establishing market in which they receive fair price.